Scott Reid, Member of Parliament (MP) for Lanark-Frontnac-Lennox-Addington, is committed to improving emergency preparedness education in rural Ontario communities as a way to assure emergency response rates are competitive with other communities. As an MP of a rural community, Mr. Reid is familiar with the unique health care issues in rural areas, and has taken an active role in finding solutions to improve the health and emergency preparedness of his community. Mr. Reid has championed the launch of the high school CPR program in his constituency, outfitting all high schools with the resources required to implement the program (mannequins, teacher training and classroom resources). “It’s wonderful to be a part of this program. CPR training will do more to save lives in our community than anything else I can think of,” Mr. Reid says. 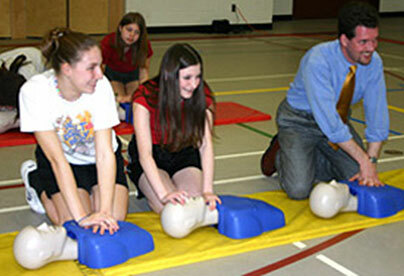 Thanks to Mr. Reid, almost 3,000 more students now receive this lifesaving training. Mr. Reid has ensured that all high schools in Lanark-Frontenac-Lennox-Addington are now equipped with the program. Mr. Reid has also greatly contributed to the spread of the ACT High School CPR Program by funding the production of a video to be used in promoting the program in other communities. The video has become a wonderful tool to inform other groups on how they can set up the program in their own communities. The ACT High School CPR Program was made possible in Lanark-Frontnac-Lennox-Addington thanks to the generous support of ACT’s community partner, MP Scott Reid and provincial partners, including the Government of Ontario, Hydro One and The Ontario Trillium Foundation. Mannequins and curriculum resources were donated to the school and the teachers were trained as CPR instructors for their students.